“What’s the use of clothes? You can strip me, but how can you clothe me again? Are you a man?… There isn’t a man here that I should be ashamed. I will not let you put clothes on me. What can you do? says Dopadi, the fierce character of short story ‘Draupadi’ written by Mahasweta Devi and translated by Gayatri Chakravarty Spivak. Dopadi, named after central character Draupadi in Mahabharata is a revolutionary tribal woman who is stripped and raped by the men in power due to her political views and activities. The Bengali heroine Dopadi takes a step forward from Draupadi as she does not seek divine intervention to protect her honor in the courtroom full of men. 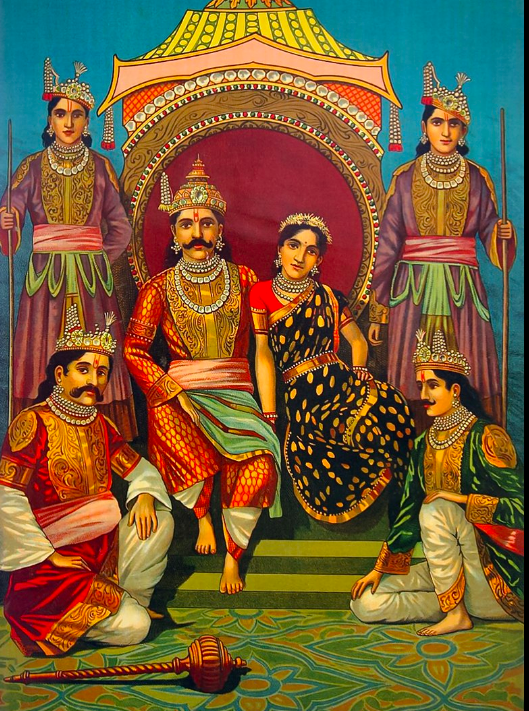 Both Draupadi and Dopadi were the victims of the patriarchal systems and powers and rebel in their ways. Draupadi rebukes her five husbands for not protecting her honor and also challenging their decision of staking her at the dice game when they had lost themselves. She pledges to wash her hair from the blood of her those who had tried to disrobe her. Her anger and the desire to seek revenge is cited as one of the primary reasons for the destructive war at Kurukshetra. Draupadi is one of the Panchkanyas (along with Tara, Ahilya, Kunti, and Mandodri) in Hindu culture but is not considered ideal for worship especially in the northern part of India as an ideal wife such as Sita. Draupadi is popularly known as Draupadi Amman is worshipped as the cult folk goddess in many temples across Southern India. In Gingee area of Tamil Nadu, she is considered the Parashakti or the Supreme Goddess who accompanies her five husbands to the forest to protect them. She is considered untouched, unruined and unflowered. She is known as the sister of Krishna and incarnation of Kali. One can read The Cult of Draupadi Mythologies: From Gingee to Kurukshetra a classic book by Alt Hiltebeitel to know about the folk Goddess and rituals associated with her worship. Both the women are not intimidated and frightened by the powerful men and stand strong and firm to counter the brutal violence on their body and soul. I did not understand… In one line you said draupadi is not considered for worship and in another you said she is worshipped in temple of TN. Can you explain a bit? Little confused! Also, the last line gives rise to the question – Does a gender exist to the soul (or your sense of I am)? What do you think? I have corrected this statement. Draupadi is not considered an ideal wife nor worshipped in the dominant Hindu culture in the Northern part of India. She is more of a folk goddess in the southern part of India. Though she remains a popular character across India. That’s pretty clear now… Thanks! So, why do you want to associate worship to draupadi or dopadi? Like, even the male counterparts like Arjuna or Dharma Raja or Duryodhana are not worshipped right? We worship gods and not characters. So, though what you said sounds reasonable, I am not understanding why worship? Like Sita is depicted as incarnation of Lakshmi and Rama as Vishnu. That’s understandable. But why draupadi or Kunti? They are just great characters and that’s it right? So I want to know the reason behind your thought! I didnt say that Draupadi or Dopadi (its a fictional character) should be worshipped/not worshipped. Its just that Sita is considered a great wife but not Draupadi. Though in my view, Draupadi did bear all wifely responsibilities. Ah! Yea, true! Indeed she bore a lot more! The soul is not sexed but it can reflect the essence of gender in relation to violence.